The phrase used for the title of this post is one that has, traditionally, been used to describe a taste sensation that is extremely sour or bitter, such as eating a lemon. We're not eating any lemons here, but the shoes pictured on this post surely look like they could force your toes to curl if you wore them all the time. 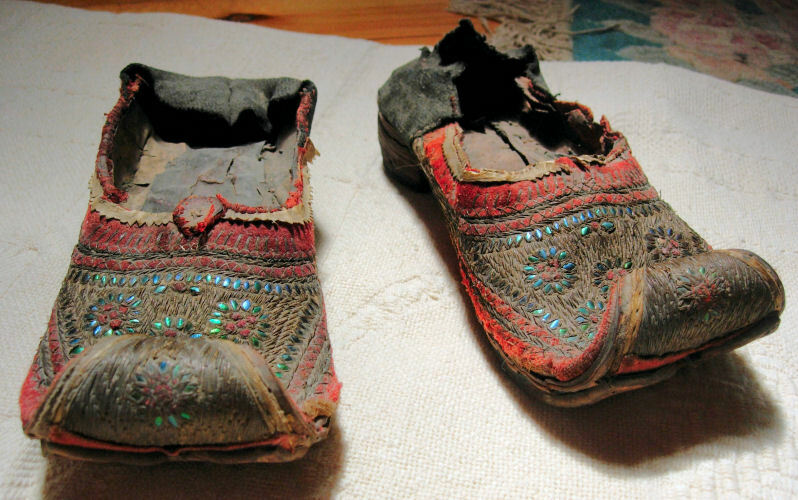 The fact of the matter is that this style of shoe was (and still is) considered comfortable in some parts of the world. It's called a Jutti, and originates in the Punjab, a portion of the Indus River Valley in (what is today with recent geopolitical divisions) northwestern India and southeastern Pakistan. 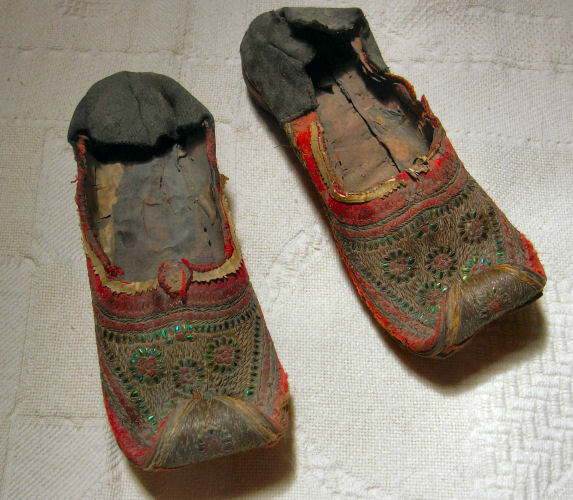 The shoes are just one example of the fabulous leatherwork that has come from the craftsmen of the Punjab over many centuries. Jutti resemble what we in the United States of America would call a 'loafer', usually having a flat sole and a closed upper (meaning the top portion covers not only the top of the foot, but also wraps around to encompass the heel). 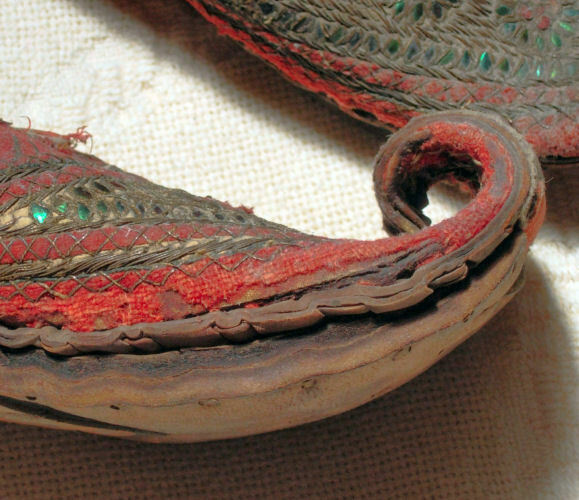 The Jutti's cousin is the mojari, which has an open back and resembling what we would call a sandal. Both, jutti and mojari, are distinguished by elaborately decorated uppers in which colored beads, pieces of mirror and shells are used to create bold designs. Juttis for men and women are made in practically the same shape, but with the one exception that for men, the toe of the shoe is extended toward a point and then folded, or curled, back upon the vamp. Tradition states that the curled toe was meant to mimic the curled tips of Punjab men's moustaches. The example exhibited here is possibly dated to the 1800s. The pair had been part of a collection exhibited in the Crawford Museum in Breezewood, Pennsylvania. 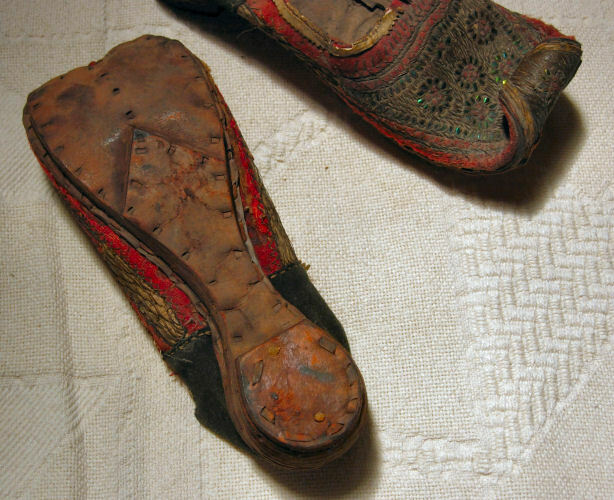 When the museum was closed, many of the items in its collections were sold, and that is how I came to possess this pair of shoes. As can be seen from certain of the photos, the soles and heels of these shoes are fabricated from layers of leather sewn together with leather thread. The uppers appear to have been constructed of a combination of leather and fabric.